It’s an interesting word “Muscle” when used in conjunction with a type of car. Quite simply it gained its name because of it loose resemblance to a muscular person. Look from the front or rear of a muscle car and you can see wide profiles; the same as when a muscular person pumps their muscles. Muscle cars had eight cylinders, when most cars had four, they were powerful, noisy and everything about them was an exaggeration of a regular car. The first muscle car is recognized as the Oldsmobile Rocket; it dates back to the late 1940’s. 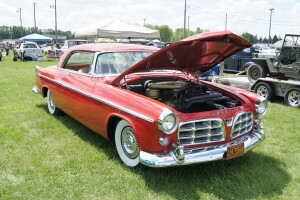 However, it was the 1950’s and 1960’s when the muscle car era took off; in fact it’s often considered that the Chrysler C300, built in 1955, really started the muscle car era that lives on today. The post-war baby boom generation had got to the age when they could drive. They had money, gas was cheap, and a muscle car was an expression of a person’s individuality. Not to be outdone by Chrysler, other manufacturers rushed to compete. Notably, Ford, Dodge and Plymouth started producing muscle cars during the sixties. Speed was an important factor, so was noise. Another feature specific to muscle cars is the amazingly bright and varied colors the body work is painted. Add these together and you really can’t mistake one; just take a look at an original Coronet Super Bee, a Pontiac GTO, or the Plymouth Road Runner. The problem for muscle cars was they were driven by young, generally inexperienced drivers. The power of the car meant drivers could easily exceed their own driving ability; accident rates soared and insurance companies got very concerned. The insurance companies retaliated in the only way they knew how; they dramatically increased insurance premiums for muscle cars and imposed surcharges for young drivers. Suddenly, despite their affluence and disposable income, they found it impossible to pay the cost of insurance. Worse problems were to follow. Muscle cars liked to consume vast quantities of leaded gas; Congress banned it in 1973. To add insult to injury, the OPEC oil embargo in the same year meant finding gas was hard. The Muscle car era was coming to a sad end. Although attempts were made to bring about a revival during the 1980’s, it didn’t compare to the original era of the 1950’s and 1960’s. However, muscle cars live on and will continue to do so. Looked after and cherished by enthusiasts, muscle cars are kept in locked garages, nurtured and cleaned before and after use. They only get used on special occasions and enthusiasts often tour around together, attending muscle car meets, where they can admire one another’s proud possession. Muscle cars are now a collector’s item. They are increasing in value and much sort after. Although it’s highly unlikely, the muscle car will ever return, those cars still around today will continue to be around for many years to come. Conklin Cars Hutchinson” and Conklin Fangman are leading car dealerships in Missouri and Kansas. Visit their sites for great deals on car sales and rentals.